Maretron's DCM100 DC Monitor is an advanced electronic monitoring device used to measure the voltage and current of any direct current (DC) power source or load. Examples of DC power sources that can be monitored with the DCM100 include batteries, alternators, solar panels, and wind generators. The DCM100 can also be used to monitor DC loads like inverters, windlasses, DC refrigerators, or any DC branch circuit. When the DCM100 is used to monitor batteries, sophisticated circuitry and software algorithms monitor battery temperature, load current, charging current and terminal voltage to precisely compute battery state of charge, and time remaining. To measure current, the DCM100 uses an included state-of-the-art Hall effect current sensor which simply slips over the wire - you don't have to break connections or install connectors as you do with inline shunts used by other solutions. Best of all, the DCM100 is NMEA 2000® certified so you can view any and all DC information anywhere on the vessel using a compatible NMEA 2000® display. 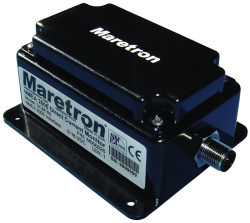 The DCM100 is a key component of Maretron's N2KView® vessel monitoring and control system.